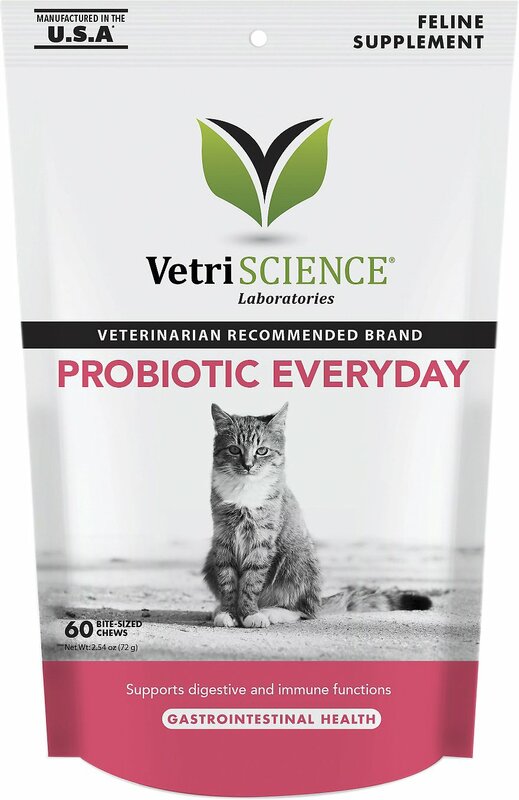 VetriScience Probiotic Everyday Gastrointestinal Health Cat Chews provide the optimal balance of probiotics and prebiotics to support your cat’s digestive health and immune system. This daily probiotic delivers over 100 million CFUs of highly stable bacillus coagulans, which helps fight the growth of unwanted bacteria. Meanwhile, soluble prebiotic fiber feeds the healthy bacteria that’s beneficial to your cat’s everyday digestive comfort. Daily probiotic supports gastrointestinal health by delivering over 100 million CFUs of highly stable bacillus coagulans, which helps fight the growth of unwanted bacteria. When all tests came back normal, my vet recommended probiotics for my problem cat - then 6 months old and peeing/pooping in all the wrong places. 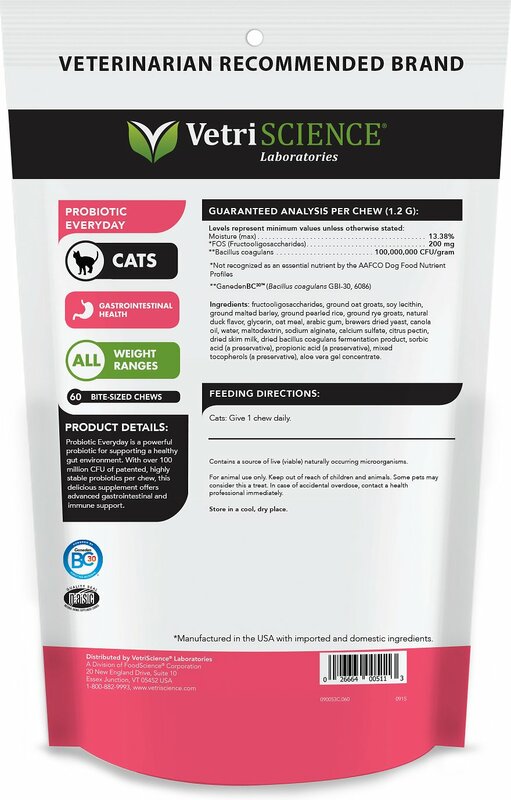 I looked at options and chose a chewable over the vet-recommended powder to sprinkle over food. I wanted to see her swallow her dose. In less than a week, her inappropriate behavior ceased. Every morning she hops to the kitchen stool and waits for her "fishie". She's been taking these daily for 5 months and still savors her treat. Thank you, VetriScience for the difference these fishies make in my cat and in my peace of mind. My latest rescue grew up in a hoarding house and is very food motivated, unfortunately she has a sensitive stomach and when she eats too many treats she gets diarrhea.I am trying these as a good option to keep her tummy troubles under control. So far she likes them a lot and they seem to be helping. Note that two of my other picky cats don’t seem interested in them. As any cat parent knows cats are very particular so there’s really no way of knowing if your cat is going to like them or not. For me they are a good solution since the cat they are for (primarily) does like them. Percival has been having some old age digestive issues so I decided to try some probiotics. I've tried two brand so far and he won't even try them. The individual treats are quite large and even when I break them up and put them in his food, he manages to leave the pieces. So I can't say if they work or not. I'll keep looking. My cat, who is a pig and will eat almost anything, literally ran away from it in fear. I’ve never seen him turn away a treat, but he hated this one. I’m really bummed I have a full bag of probiotics that’ll go to waste. We really wanted this to work for our formerly bottle fed kitten. He has some stomach issues, and he loves his other treat, but he just wouldn’t eat these. I have used this product made for dogs for a while now but after adopting two shelter kittens, one of which handled the new stresses a little harder than the other I ordered these. She is a tiny kitten so I do have to break it in two but both eat right up like a treat. Cleared up her loose stool in a day, now I give every other day for just a maintenance routine. I have a 6 year old small kitty (7 pound) that is super picky and a super sensitive stomach. I have tried all types of food and treats. Since starting her on this product she has done amazing. She eats it right up and hasn't gotten sick once since she has started this. Highly recommend for cats with digestive issues. I was hoping this would help with my cats IBS and I could get him off the steroid he’s on, but he’s not a fan of these treats at all. If I squish them and mix them in wet food, he’ll eat around the pieces and leave them in the bowl (he’s super food motivated so this is very unlike him...I use this method for him to get his steroid pills daily). They also have an awful smell to me, it’s very strong and he doesn’t seem to care for it either. I adopted Ms. Elsie from a home that had a health issue that travelled through all of the cats and kittens so after getting her healty I wanted to do the best by her and keep her that way. The probiotic my vet gave me she wouldn't eat. This one from Chewy she thinks is a treat and looks for it every morning.